Unlike some authors, I didn't come from my mother with pen and paper in hand, spouting stories. Writing slipped into my everyday life almost unnoticed and hid if I caught a glimpse of her in my mirror. When I was in elementary school, writing was the furthest thing from my mind. The learning curve for reading was like climbing Mt. Everest. Thankfully, three awesome teachers provided the tools I needed to master this skill. My parents, who were strong believers, started taking me to midweek service. The Word of God and much prayer on their part got me through this difficult period in my education. One day, everything clicked. Letters and words made sense, and I was off and running. Writers: When did you first develop an interest in writing? Did you face any unusual challenges? Readers: How did your love of reading begin? Please share. When I was in grade school, I messed around with my dad's typewriter. I called what I tried to do,"The Death of Doctor Brown." I didn't get much encouragement at that time. AS a young adult, I wrote devotions when I had to give them at missionary group meetings. I also wrote summaries of those meetings for submission to the newspaper. I went through a time of depression and started thinking a lot about my circumstances. I wrote those thoughts in a steno-notebook to gain perspective on what had happened and how I flet about things. Sometimes what we need to overcome becomes what we do best at, which your story conveys! Glad you had those two teachers to help you overcome! I have always wanted to write, and began writing stories in elementary school. Sometimes I also wrote plays that my BFF and I would act out in my bedroom. 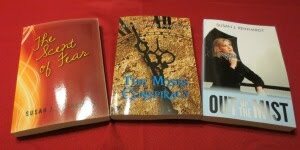 My love of reading I believe is what developed my passion to write! Math was never my strong point either. I always say, "Give me words." It seems so obvious now, but at the time it never crossed my mind that I'd actually be writing novels. You've had an interesting journey. Life experience gives us much to share. I remember my first typewriter - a Remington Manual. This girl is thankful for computers - huh, never thought I'd hear myself say that! Like you, I was big on imaginative play. Even back then, I guess the writer equipment was kicking in.